My girls and I watched the royal wedding of Will and Kate while wearing dresses and drinking pink tea. It is still on the DVR, and we still watch it at least once a week. What a magical event! As we were watching the guests walk in we were in awe of their coats and hats! When I found out this week's challenge I knew what I wanted to do: turn the sienna dress pattern into a coat fit for a royal wedding guest. I started with this beautiful turquoise wool and decided to felt it to make it easier to work with. I was very pleased with the results. This is not the first jacket I've attempted, but it is the first jacket I've ever completed! I wanted the floral dress to have a very modest cut on the top, fit for such a hallowed event. It has a growth pleat in the front so that when my model outgrows it I can let it out for her. The hat is my favorite part! Something about peacock feathers just screams "royal" to me. The gold ribbon on the hat is vintage, I found it at this adorable antique shop in a rural town. It gave me the perfect color pop I needed to complete the look. Come on over to I Make Stuff for more photos and details! I was very excited to do the Sienna Dress Remix this week. It's by far one of my most favorite patterns ever! I have made lots of dresses for my little one with it, so this time I wanted to try and think outside of what I've already done with it and what I have seen others do. I first wanted to create a little cardigan. It was very simple to do with this pattern. I even used a women's shirt for it, operating in Ashley's upcycling ways. Then I created a longer shirt to go underneath of it. I did some weaving down the front to add to it. It's an easy technique to do. I also upcycled a t-shirt for that top as well. And we can't forget about accessories. I crocheted a little slouchy hat to go with it and we made a fun little feather necklace to add some color. You can check out more pictures and details on the Happy Together blog. We followed the pattern to a T, all the way up to the neckline and the sleeves. When we got there, we cut them both straight off and tied out a little halter with a raw-edged tie and, to make it a little more fun, on the back we added a little peek-a-boo triangle that we embellished with a big, accented button. We think we remixed just enough to bring out our own personality while still staying true to the original Sienna Dress pattern! Come check out the rest of the details at iCandy! I'm so happy to have made it through the last round! Thanks, voters! This week we got to work with, what I'm sure is, one of all of our favorite patterns. I have made countless dresses from this Siena Dress pattern. I wanted to take it up to the next level and make something slightly costumey and over the top, which is not something I normally do. 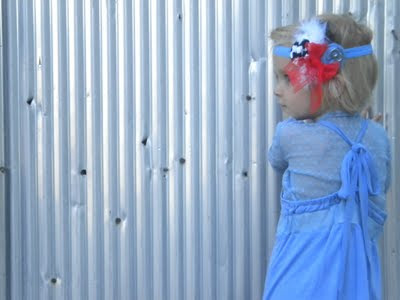 I envisioned this dress for a vintage circus themed themed birthday party. (You can see my inspiration board here) I wanted to incorporate the bold stripes of the tent and the wide front opening, the bunting flags, circus lettering and some black for that vintage circus costume element. It has rust and cream colored stripes on the skirt with a grey ruffle around the bottom with pick ups on the front. The top has a sapphire silk initial 'A' on it in circus style font. The sleeves are another stripe with pick ups and they have teeny grey bows at the shoulder.To top it off, a black and grey headband to match. The back has a big detachable dupioni silk bow. The socks are little bunting flag socks. What I love about this is you can take it up a notch with a tutu or take it down by removing the big bow in the back and letting down the pick ups. It's exactly what I love about this pattern- you can use it for anything! I hope you like this look as much as I do! 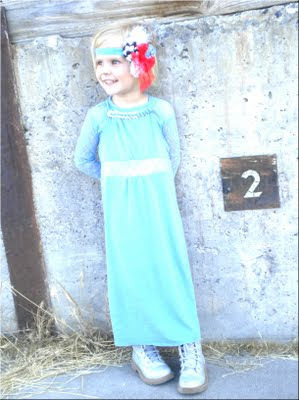 Altering Patterns may be one of my favorite things to do, and I was super excited when I found out we would be working with Lil Blue Boo's Sienna Dress! 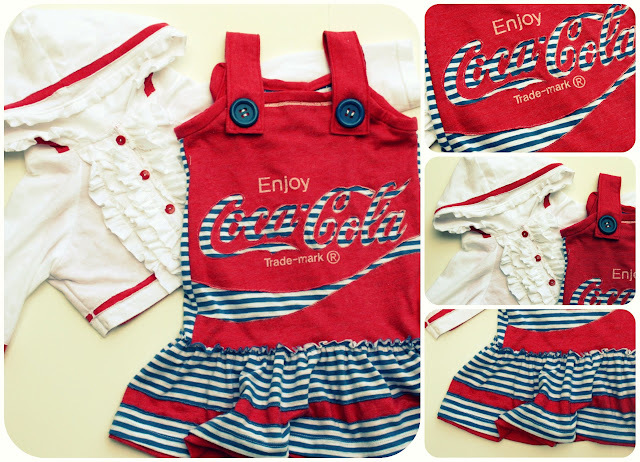 When I saw the old school Coca Cola T Shirt, I knew immediately that I wanted to work with it for this challenge! Altering the neck and sleeve lines, I turned the Sienna Dress into this adorable jumper for my 2 year old. Furthermore, I took the same Pattern - shortened it, added a button placket in the front, as well as a hood around the neckline to create the matching hoodie to complete the look! With reverse applique seeming to be all the rage lately, I thought it would be super cute to use that technique in different ways. The obvious one being the Coca Cola logo, but the less obvious ways I used the technique was in the stripes around the bottom of the dress and hoodie. Wanting to add in ruffles to compliment the boy casual vs girly look, I worked with the ruffled button placket on the back of the jumper, adding an exposed seam ruffle along the bottom of the jumper, as well as a ruffled button placket on the front of the hoodie, ending the ruffle explosion with a slight ruffle peeking out from around the hood. Overall, I am really happy with how it turned out! 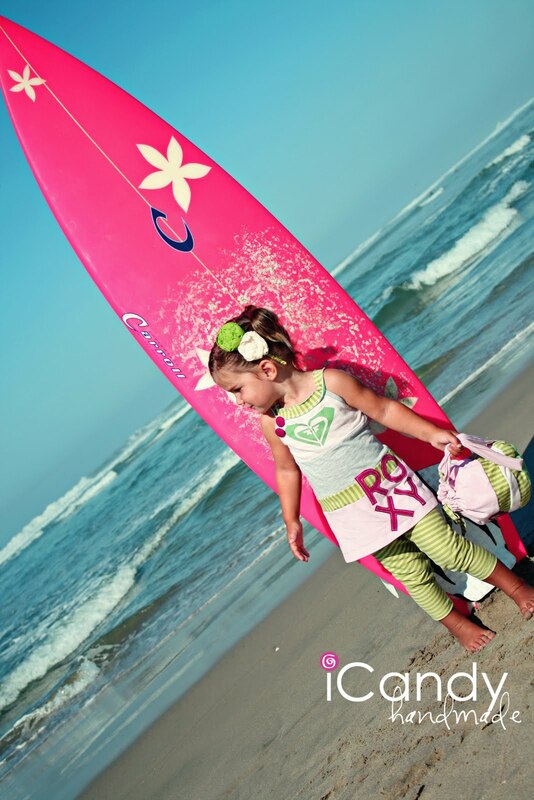 After all, what can be more comfy than a T Shirt dress for your toddler?!! Now, trying to get a 2 year old to stand still for a decent picture...that is another story!!! Lol. 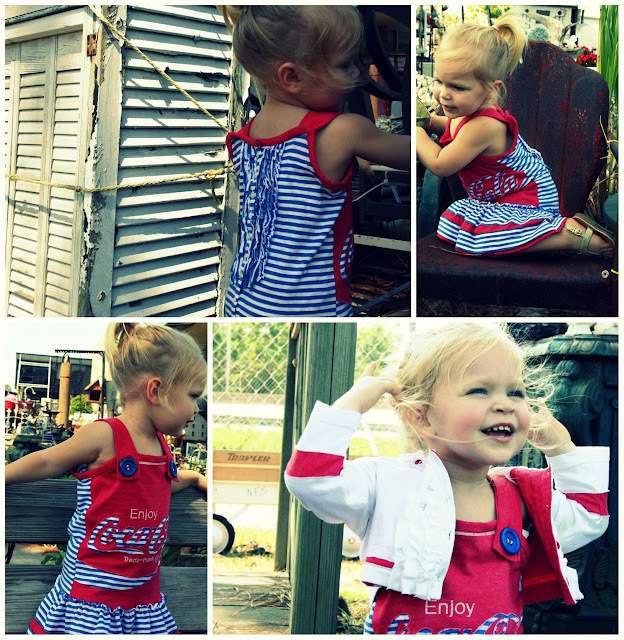 For more pictures from this photo shoot head on over to Me Sew Crazy. 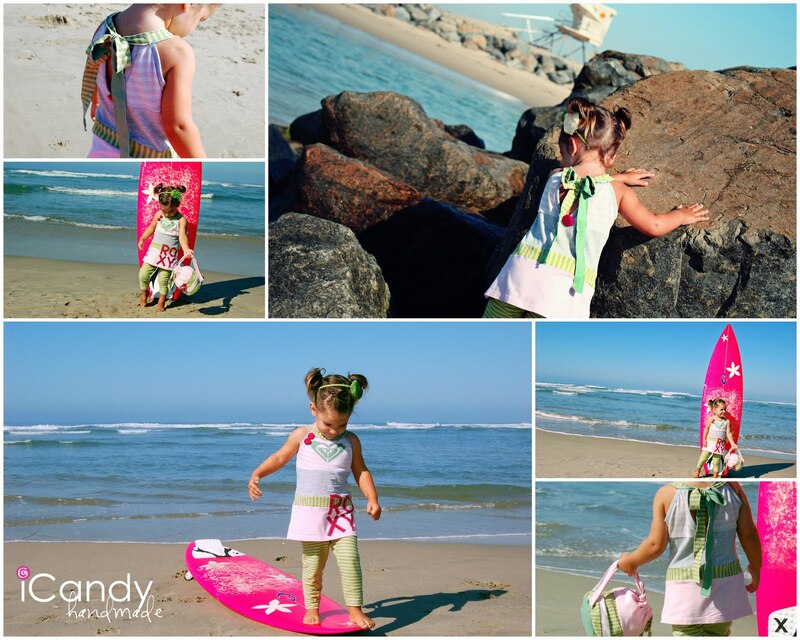 This week for the pattern remix we decided to make fancy little frocks for the girls out of the Sienna dress pattern. We did all white "Girls of a Feather" dresses with some champagne details on the front and fluffy feather tutu skirts for added fanciness. Ok...we know what you are thinking right about now....How are they going to wash those dresses? Are those really wearable? 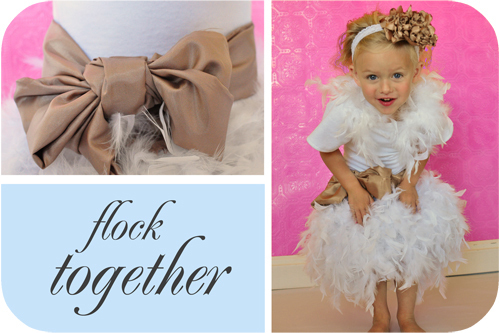 Well, we thought the same thing....and so we made the Feather Tutus REMOVABLE, so the dresses can be washed and the tutu skirts put back on again which we will show you how to do on our blog next week. 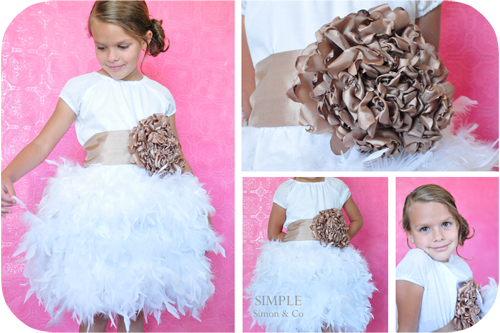 Elizabeth made this dress with white muslin and the (removable) feather tutu at the bottom. The neck and arms have 1/4 inch elastic in them, and the dress has a champange-colored, singed-chrysanthemum flower and sash for another detail. Liz made a white knit drop-waisted dress with raglan sleeves. 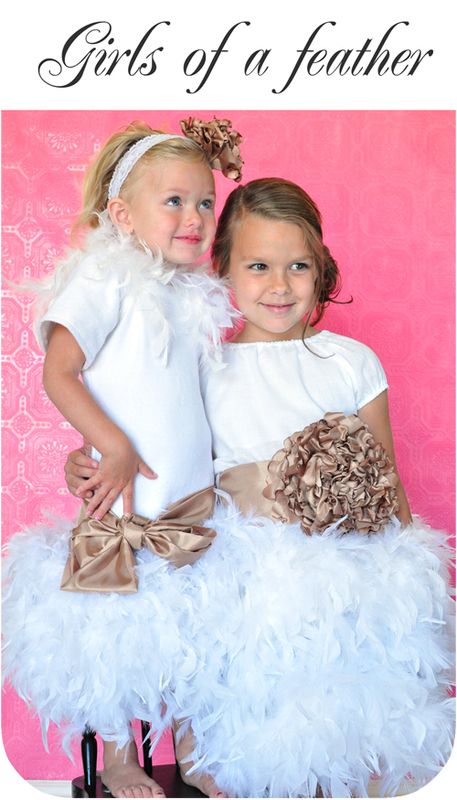 It has a removable feather collar and tutu at the bottom, also with a champange sash and front bow. Another singed-chrysanthemum on a white lace headband rounds out her outfit. And these two "girls of a feather, really do flock together." Especially when it involves tea parties, dolls, and all things girly. i am loving the maxi dress trend of the moment-- but it hasn't really taken a spot in the kid's market yet. 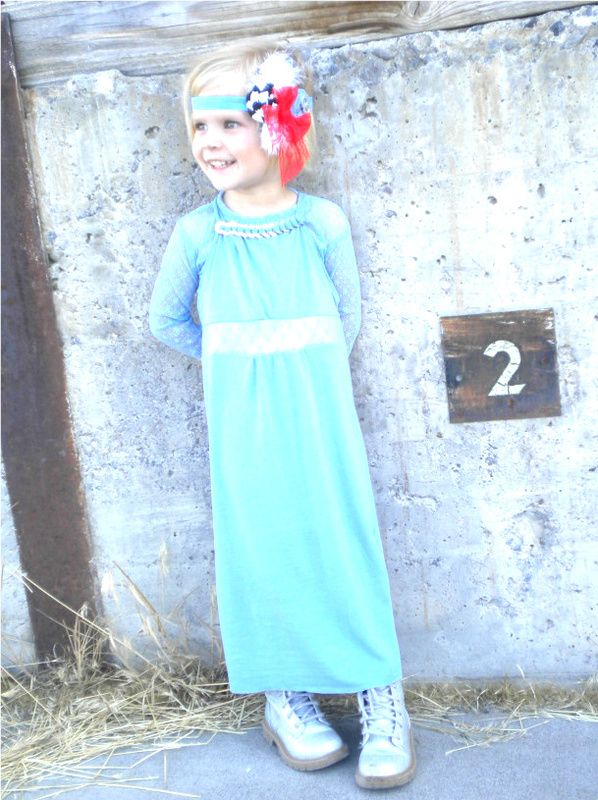 when we were given Lil Blue Boo's pattern to remix, my first thought was to make it a maxi. add some lace and a funky neckline and you have a whole new style! I've read over your blog, and I can't seem to find out when the voting starts and ends. Does a new round start every Friday? When does the voting end? Thanks! All the designs are amazing! Wow! These are some talented and inspiring women!